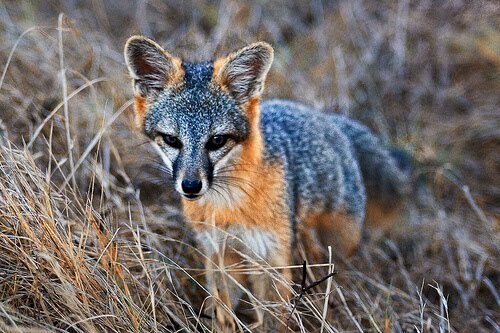 He’s a critically endangered Santa Rosa variety of Island Fox. They are endemic to Santa Rosa Island which, I learned, means they’re native too the island and are only found there. A few of these foxes are also kept and bred at the Santa Barbara Zoo. These creatures are curious and playful and grow to be no larger than a house cat. Santa Rosa is part of an isolated national park where only a few dozen people visit annually. With limited contact with humans, this fox didn’t have any fear of me. Once I worked my self into a position down wind of him on a hill, he couldn’t leave me alone. He was so curious and playful that I finally had to shoo him away before he climbed onto my lap! What can I say? Foxes love me. You can see a few more great shots of him on my flickr page. This entry was posted in photography, travel. Tagged california, channel islands, santa barbara, travel.